Medieval 2: Total War - computer game turn-based battle. 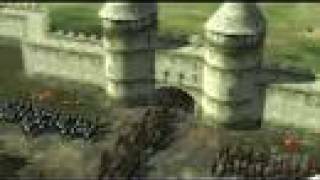 Game Medieval 2: Total War representative subsequent games through one after the Medieval: Total War. As with the previous series games, and this option is not enough fans in the whole world. Just the development of our stories with you, here come the same change in events: the discovery of gunpowder, the invasion of other settlements and all sorts of other great events. About the greatest series of games, so perfectly aligned strategically and economically perfect, you can talk and talk endlessly. After all, it is really good project. Company Creative Assembly is not much change has filed a series of previous game Rome: Total War and the result was a game Medival 2 Total War. That's only true fans, or those who played in other series of games, understand that significant changes that had happened. Better cost you try to play yourself and then make conclusions. First we need to download Medieval 2: Total War, with all the necessary computer program to jump. But first, we advise you to browse the Medieval 2: Total War screenshots and videos, and read up our stuff, although the creators thought out option for beginners - learning process. Perhaps to the dismay of craftsmen - educational game obligatory passage. Kingdom of France - has a professional army, gendarmes, heavy cavalry. Holy Roman Empire - all the characteristics of a strong army, but not in the later period. Republic of Venice - with the presence of a weak cavalry and Marine infantry units have the strongest and the militia. Kingdom of Spain - has a strong and professional cavalry, infantry, army and navy. For all further game has been dependent on the choice of faction. So pay attention to it. You as the best leader should invest as much effort and playing on military maps outside of his home and Equipping and protecting your estate. Here is a major focus of religion. Make every effort that would be the Pope knew about your compliments. And that unbelievers quickly removed from the game. Game Medieval 2: Total War welcomes willing and eager to win the whole building a strategic and economic sense combat action. Game will not leave indifferent and will attract high-quality graphics. Music seem familiar, since not much has moved since the last version changes the game. It costs only to find the site and the game Medival 2 Total War download. And you have to conquer the world your strengths and talents. You play good!